2018 Four-Time Gold Medal Winning Book in Children's Education.Finally! An easy-to-understand English grammar book with fun grammar lessons for middle grades and up. An excellent education reference for classroom and homeschool grammar lessons. The Dragon Grammar Book is the perfect grammar study guide to help readers learn the rules of grammar and improve language art skills with ease and enjoyment. From multi-award-winning children's fantasy author, Diane Mae Robinson, The Dragon Grammar Book provides a fun and engaging approach to learning English grammar through easy-to-follow lessons, humorous example sentences, and chapter quizzes to conquer all those tricky grammar rules.Easy-To-Understand Lessons organized to gradually build on the basic grammar rules toward an intermediate level.Engaging Examples Sentences explain each grammar rule through a humorous and creative writing style. An Expansive Resource of grammar terminology, confusing words, punctuation rules, types of sentences and proper structure, parts of speech, verb agreement, and more.Quizzes with Answer Keys reinforce each lesson before proceeding to the next lesson. Featuring the zany fantasy characters in the author's international-award-winning The Pen Pieyu Adventures series, The Dragon Grammar Book is sure to be enjoyed by kids, teens, young adults, and the whole kingdom. "Oriented toward pragmatic, real-world usage, The Dragon Grammar Book is a great resource for kids, their teachers, and anyone else who'd like to know more about language and how to use it. Most highly recommended." --Jack Magnus for Readers' Favorite.2018 Book Excellence Awards, 1st Place Winner, Education & Academics.2018 Readers' Favorite International Book Awards, Gold Winner, Children-Education.2018 Literary Classics International Book Awards, Gold Winner, Educational Books.2018 Lumen Award for Literary Excellence. 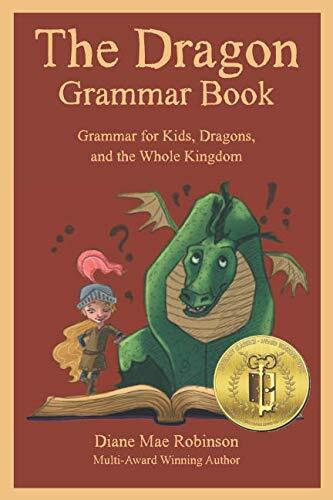 The Dragon Grammar Book by Diane Mae Robinson is a clearly written, informative book of grammar for anyone ages 12 and up. It begins with an explanation of the author’s purpose for this project and a list of important definitions that should help readers understand the grammar and punctuation rules that are well-organized into ten chapters.